A 45 minute water taxi ride takes you from Belize City to the island of Caye Caulker. We chose to go to Caye Caulker instead of the more-frequented Ambergris Caye (San Pedro) for exactly that reason. We were looking for a laid-back island experience and trying hard to never experience another Cancun - we envisioned San Pedro as an overrun tourist zone complete with mini-golf and go-carts. The very first thing you fall in love with about Caye Caulker is the water. We were not strangers to the crystal blue waters of the Caribbean but the closer we came to the island the more we realized there were still higher levels of beauty to come. The florescent blue waves immediately drew me in. I’m pretty sure I started putting on my swimsuit before we reached the shore. There are several inexpensive hostel-style guesthouses on Caye Caulker but, having camped for the prior two weeks, we opted to splurge and get a cabana with a pool for a couple of nights. We split the expense with our friends "Here Until There" and "Cornwall 2 Capehorn." Our pool, however, turned out to be un-swimmable (of course it was) – but with this kind of ocean water to swim in, we didn’t mind much. The island, like much of Belize, is diverse. A multitude of ethnic origins live and work in the town populated with less than 1500 full time residents. Businesses and homes are either painted in bright pastel colors or plain wood weathered over time by the salty air. Hand-painted signs for businesses add to the laid-back atmosphere. We found the people living on the island to be less jaded by tourism than you would expect in a place where the economy is completely based on it. The island is clean as is the shoreline and the people, genuinely laid back and friendly. We previously read on several other travel blogs that Caye Caulker (and most of Belize) would be full of men grossly catcalling women on the street. I was mentally prepared for it but, on the island, it never happened. Not once. And except for our welcome-to-town masturbator on our first night in the country, nothing like this has happened much in Belize, period. Maybe its because we aren’t in our 20’s anymore, but, I don’t know, I’d like to think a person who thinks they have a chance by yelling out to random women to “smile!” or to “insert anything sexual here!” wouldn’t be very discriminate. I’m not saying it doesn’t happen, I can only say that hasn’t been our experience. This is the off-season so prices for activities were relatively low. A half-day snorkel trip costs around $35 USD and a full day, $60. Scuba, depending on your experience, is roughly twice that cost. Nothing in Belize is particularly inexpensive, apart from one thing - Lobster. We ordered a pizza one night and it was three times the prices of a lobster dinner. The delivery guy told us,” Lobster is literally crawling out of the ocean onto your plate here – mozzarella, on the other hand, arrives by boat.” In Caye Caulker, a large restaurant bought lobster with two sides and sometimes a drink, ranges from 20-35 BZD (10-17 USD) and if you hang around by the various docks between 3:30 and 5 pm you may be lucky enough to snag some fresh-catch lobster for $3 USD – $6 USD depending on its size. We did this several times and grilled them at the cabana. Caye Caulker is an island, for sure, but without a ton of lounge-able or wide-spanning beaches. Very few at all, actually. 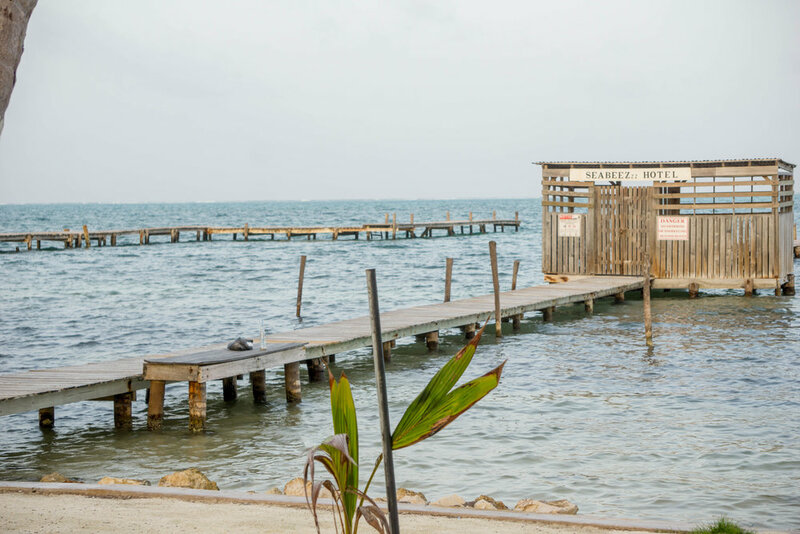 And although beaches are public land in Belize, many of the hotels and resorts have claimed the Oceanside area in front of their property as their own. You can find small areas to lay out but with the sandflies, I'm not sure its worth it. The water is warm and shallow pretty far out so if you aren’t much of a swimmer or just don’t want to work too hard, this is a fantastic place to get in the water –its warm and amazing. The island has quite a few cute bars but they are meant for day drinking with beautiful scenery, many closing at 7 pm. This is not a nightlife island. The best way to get around the island is to rent a bicycle from one of the many vendors. You can easily walk from one end to the other but, in the heat, bicycles were our preferred transport. If you come here, don’t miss out on the incredibly cheap Fryjacks from Errolyn’s on Middle Street. You’re welcome. Caye Caulker was dog friendly, more than we have found in the rest of Belize. Gracie had a big time chasing toys into the gorgeous water. The last thing anyone said to us before we boarded the Water Taxi from Belize City to Caye Caulker was (again, insert a Rastafarian-style accent): “Let your heart not be troubled!” I have to say, while I was on the island, my heart, was in fact, not troubled – about anything at all.